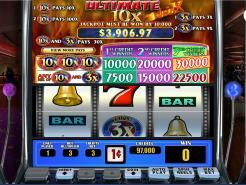 Ultimate 10x Wild is the second in the series of slot games called WILD X that are packed with features and aim to deliver maximum excitement and payback for the player. Ultimate 10x Wild includes nine winning symbol combinations across its single, central pay-line, two wild multipliers and the ever-growing progressive jackpot that must win by $10,000, so keep an eye on this one! Additionally there’s a gamble feature allows the player to double-up on any win! It also works wonderfully on a smaller screen so it’s ideal for mobile or tablet play. To start; choose the number of credits to wager using the Credit Up and Credit Down buttons. Play one, two or three credits per game. Each credit played increases the overall pay-out on a winning combination as shown on the pay-table above the reels. Second, decide on the value of the credits to be played using the Coin Up and Coin Down buttons. Play from as little as 1 cent. maximum coin value is $5.00. Three credits at $5.00 per credit equals a maximum bet of $15.00. Finally, set the reels in motion using the SPIN REELS button. Miami Club Casino :: Ultimate 10x Wild slot – PLAY NOW! Miami Club Casino :: HOT ROLLER Goes Live Today!